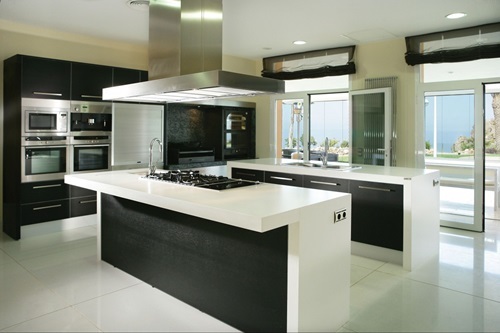 Black and white kitchens gained huge popularity, for it provides that high tech ambiance that is highly comforting and fashionable at the same time. 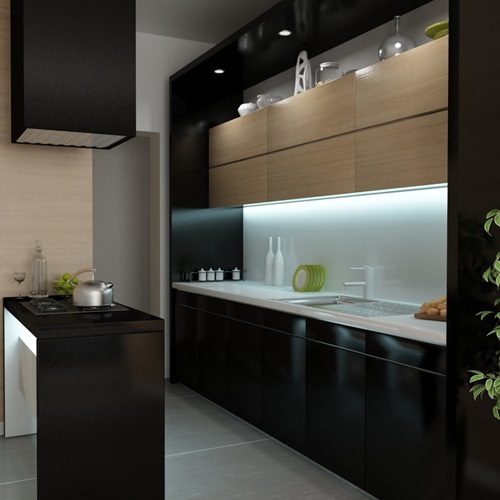 That monochromatic kitchen had been held up by designers in the past generations; however, the style has now been renewed by adding accent earth colors to break the uniformity and sterility of the stark black and white atmosphere. 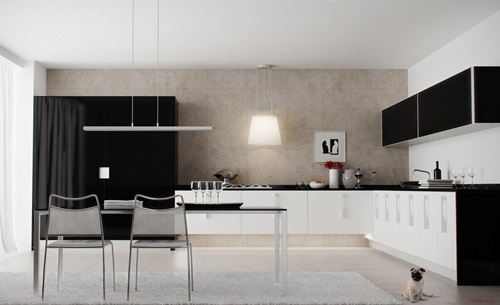 Therefore, if you choose that style, opt for using warm colors as red or neutral colors as gray or taupe for backsplashes, walls, and window treatments. Also, lighting as being of highest importance in any workplace, could be used to bring up the naturalistic cozy feel by adding recessed spotlights or luxurious crystal pendant lights. 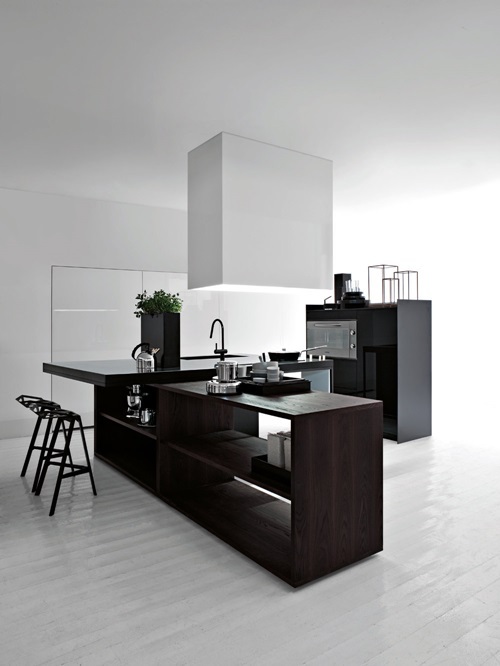 Cabinetry of any kitchen takes 75 % of its space; therefore, it’s considered the focal point in black and white kitchens. 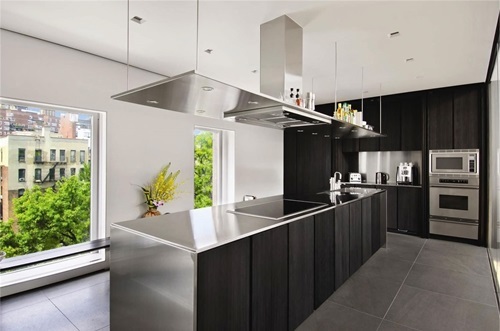 For example, f you have an open floor kitchen, then black cabinets are the perfect choice, though they would look dreadful in a galley kitchen. 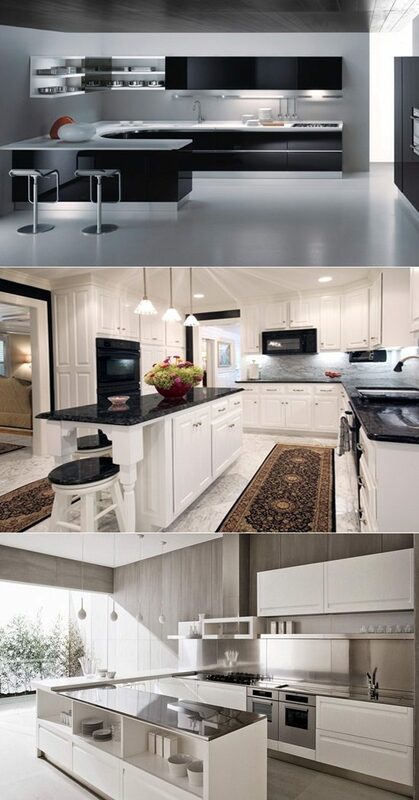 On the contrary, white cabinets would give greater spaciousness and light. 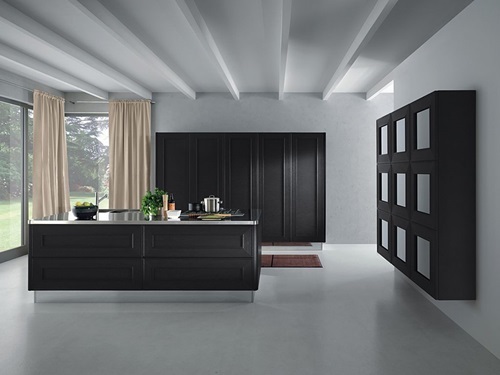 In black and white kitchens, the wood material is covered by the exterior colors; however, opt for a more durable one such as maple, to withstand heat and steam. 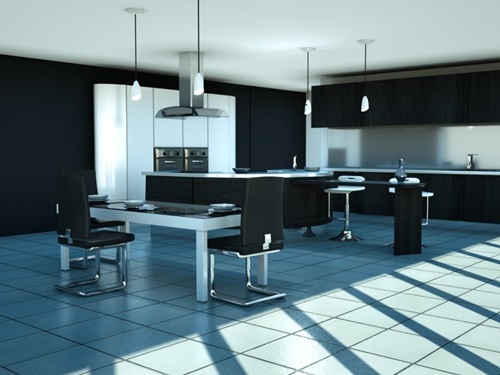 Black and white tiled floors are extremely beautiful in kitchens and bathrooms. The squares are tilted from edges making it more fashionable than the normal checkered laminate ones, and of a diamond like shape. 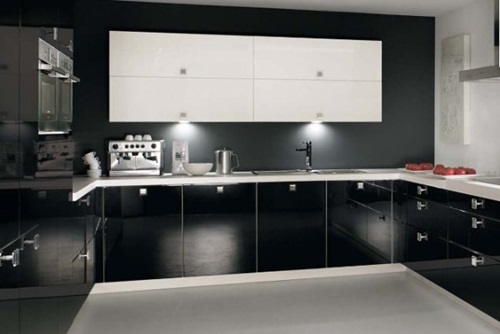 They are highly elegant and luxurious if used in a black and white kitchen. Though, you are the one to choose the suitable pattern according to your personal preferences. There’s the hexagon pattern, and the mosaic look. 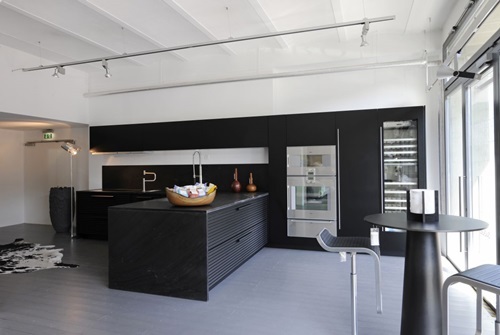 Also, if you want to add an earthy neutral look, check out the wood flooring styles. 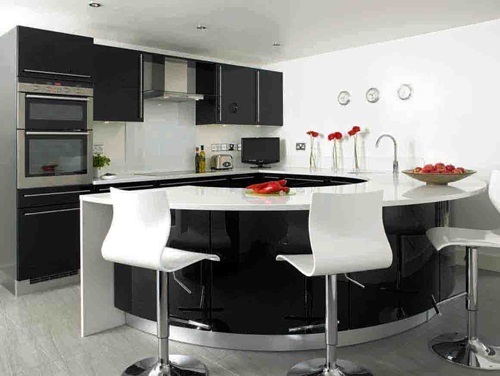 As for countertops, Black granite stones mix perfectly with any color scheme. It’s also of highest durability. 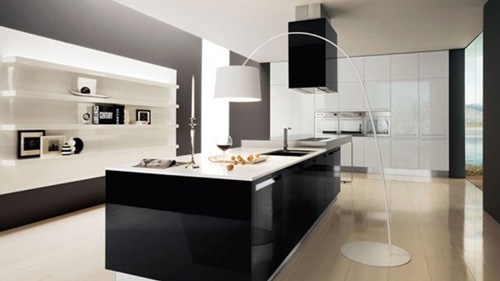 However, make sure you test the granite type before buying it to check its originality. 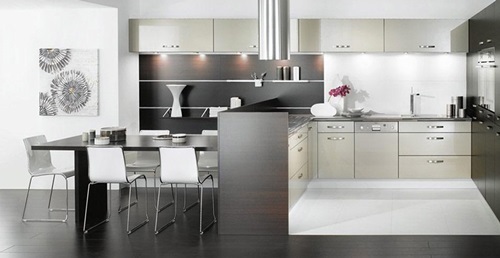 If you choose white cabinets, try to spark the plain color by adding stainless steel appliances and knobs to the cabinets’ doors as well as to the kitchen door. 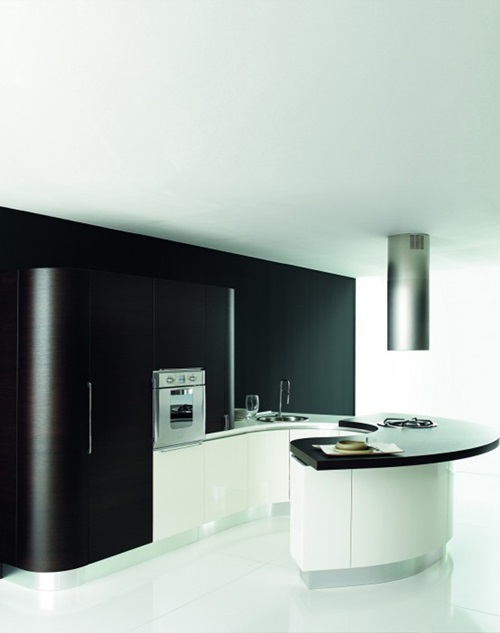 Speaking of which, contemporary cabinet doors are designed in a sleek and flat form that add to the high tech ambiance. 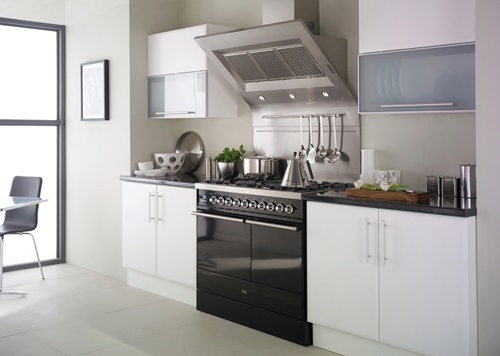 Although, If you want to make a fashionable twist, opt for the decorated textured glass door panels.